Patrick’s martial interests rubbed off on his children and is reflected in their early reading. In addition to military magazines such as the United Service Journal, the children also read about war in military biographies, such as Walter Scott’s eight-volume Life of Napoleon, which Charlotte and Branwell each had read by the time they were teenagers, Dr. Butcher said. So when they came to create their childhood fantasy kingdoms of Angria and Gondal, it’s no wonder that they had a heavy military aspect. It was even a gift of toy soldiers that really sparked the siblings in the creation of their sagas. Each sibling took one of the toy soldiers as his or her own and named him. Charlotte named hers after the Duke of Wellington, her childhood hero. 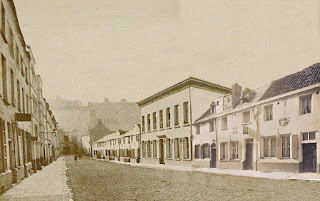 The narratives eventually became very complex – Dr. Butcher compared them to Game of Thrones -- with Charlotte’s Zamorna character based on the Duke of Wellington’s son Arthur and Branwell’s Alexander Percy character based on Napoleon – or at least on the British public’s perceptions of them. 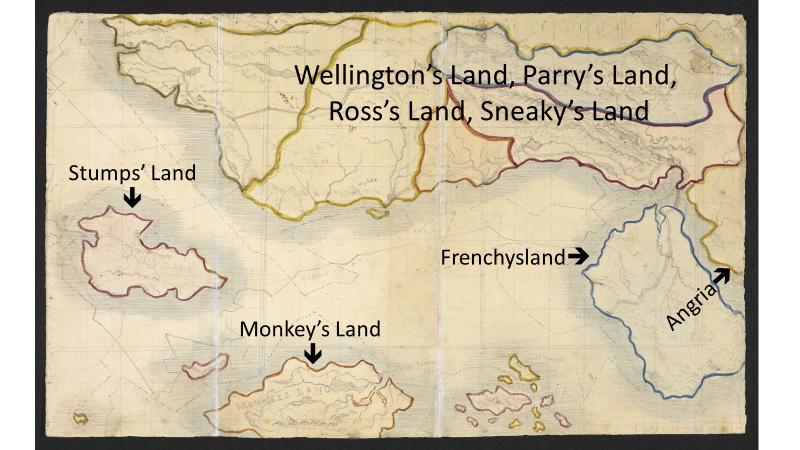 A map that Branwell drew for the Angria stories shows several distinct areas, including Wellington’s Land, Parry’s Land, Ross’s Land and Sneaky’s Land. 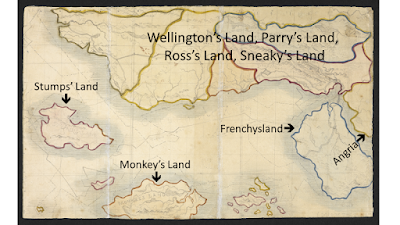 Neighboring territories included Frenchysland, Monkey’s Land and Stumps’ Land, which was a sort of retirement community, Dr. Butcher said -- as soon as they got bored with a character, they would stick them in Stumps’ Land. Branwell’s map of the Brontë children’s fantasy world. 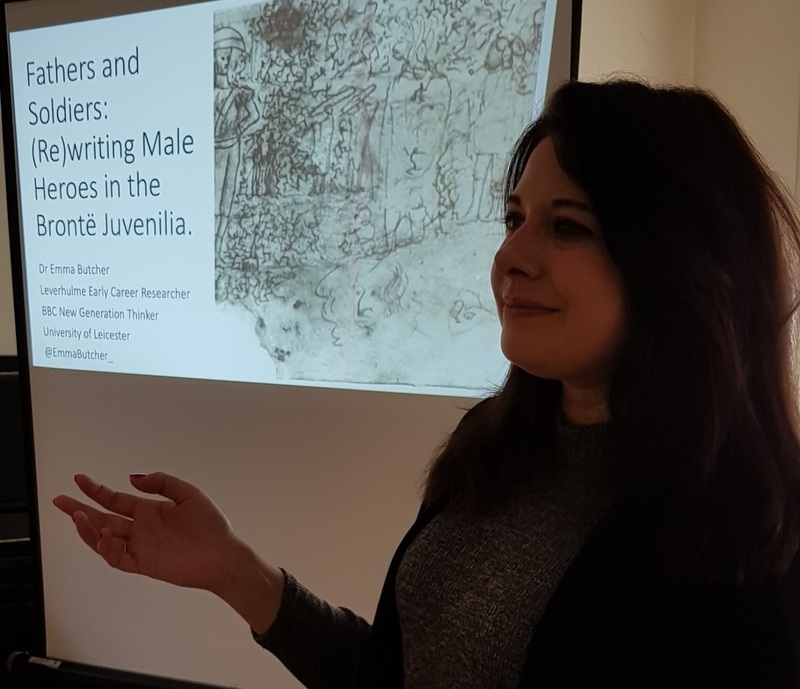 Dr. Butcher stressed that the fantasy juvenilia was never meant for publication, so the young authors felt they had a safe space where they could explore different themes and story lines without worrying about social conventions. "But the adult works are rooted in the juvenilia," she said. In addition to militarism, their youthful reading also included many examples of dysfunctional families – in Shakespeare plays such as Hamlet, in many of Walter Scott’s novels and in biographies and stories about Lord Byron. The family of the Duke of Wellington, Charlotte’s hero, also featured fractured relationships, Dr. Butcher pointed out. But the image of the army as a family group and Wellington as protector and commander -- "very much a father figure to his soldiers" – also came through, she said. There were many flattering depictions of Wellington on the battlefield in contemporary accounts; he was often shown on high ground, appearing as a divine presence or protector. While Zamorna is mostly portrayed as an absent parent in the Angria stories, Dr. Butcher said the most problematic father figure is Alexander Percy, who had filicidal urges toward his sons – he wanted to kill them. In an interesting contrast, Percy’s relationship with his daughter is loving and doting, though she is caught in the firing line of his militaristic intentions, she said. Dr. Butcher noted that the Angrian world of Charlotte and Branwell contains few portrayals of strong women, whereas Emily and Anne had women ruling their kingdom of Gondal. 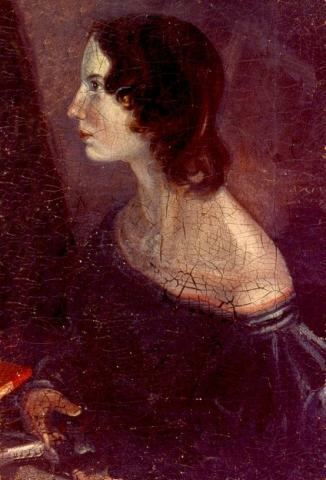 The main exception to this for Angria is Charlotte’s story "Henry Hastings", which features a strong female character, Elizabeth Hastings, who is a prototype of Jane Eyre, she said. 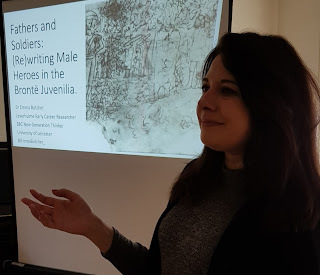 Another interesting point about the juvenilia is that it "is all responsive," Dr. Butcher said – Charlotte and Branwell are constantly responding to each other in the stories. "One would change a character’s name just to annoy the other, or kill off characters," she said. She also stressed the importance of Branwell to the early development of his sisters’ writing as they discussed their stories among themselves, until he succumbed to addiction and let his early promise go to waste. "Branwell was a very integral part of their early imagination," said Dr. Butcher, who is very much a member of "Team Branwell". 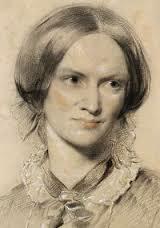 "Branwell is a very important figure in this think tank." Dr. Butcher’s talk was intriguing, but the question remains: Has she inspired us to read the juvenilia?